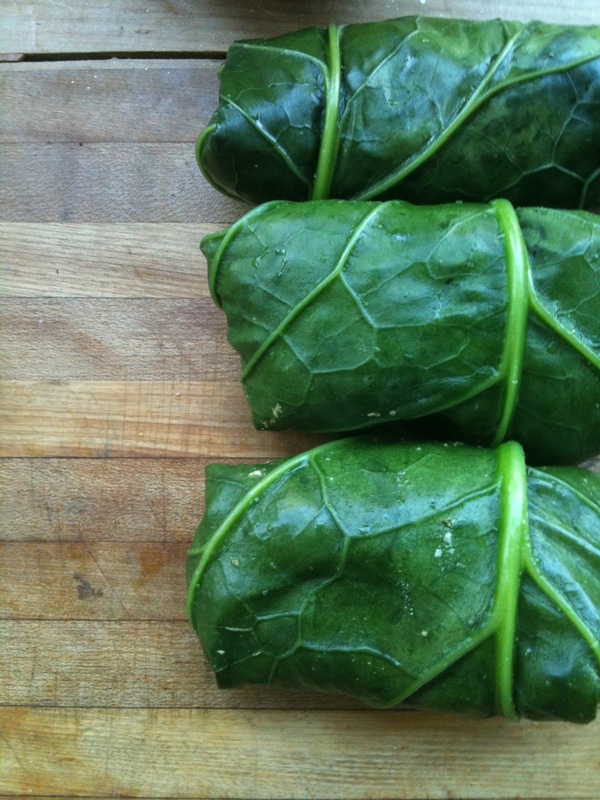 I’ve done a post with collard wraps before, but I just wanted to remind you how awesome they are. You can literally wrap ANYTHING; Tuna salad, chicken salad, lunch meat with some tomato and avocado… YUM! This egg salad uses pesto as a binder, but if you’re more of a mayonnaise person, use it! 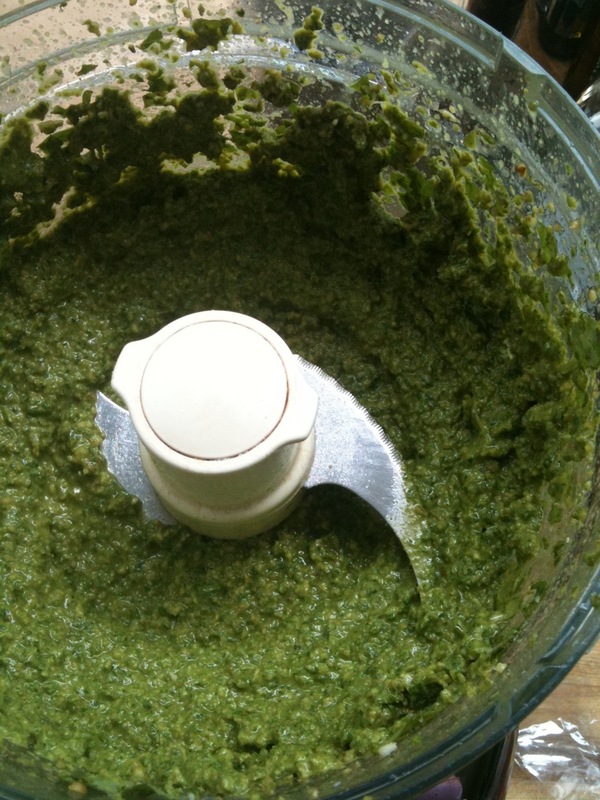 My recipe for Cilantro-Pistachio pesto would also be great for those who aren’t super big on basil. 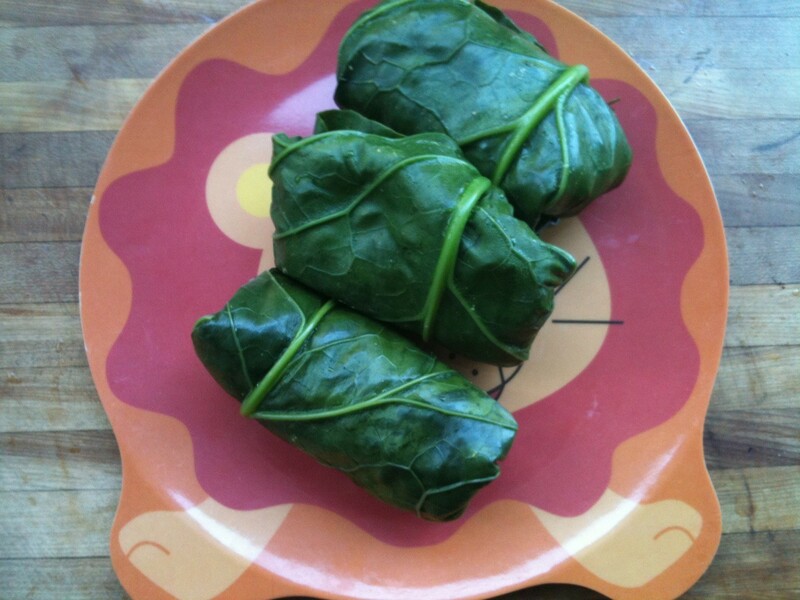 Using collard wraps makes grain-free and low-carb lunches a bit more accessible for those times when you need something that’s relatively portable and not particularly messy. Every thing is held in by the leaf, like a tiny burrito! Kids love this kind of stuff because it’s fun to eat. Awesome lunches get the LION PLATE! 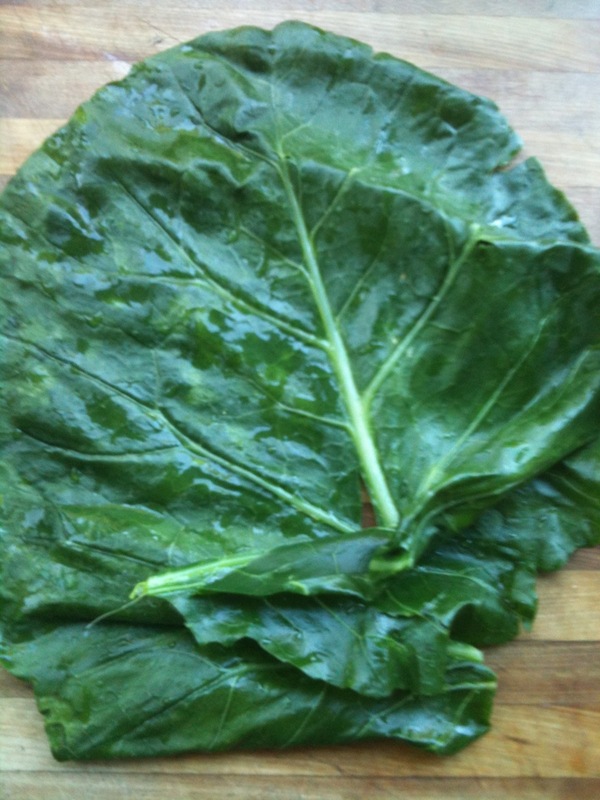 Trim the stems off the collard leaves. In a large skillet, heat a half inch of water over high heat. Add collard leaves and cover. Steam until wilted and “bendy”. Remove from water to dry. In a bowl, mash together pesto, eggs, and cucumber. 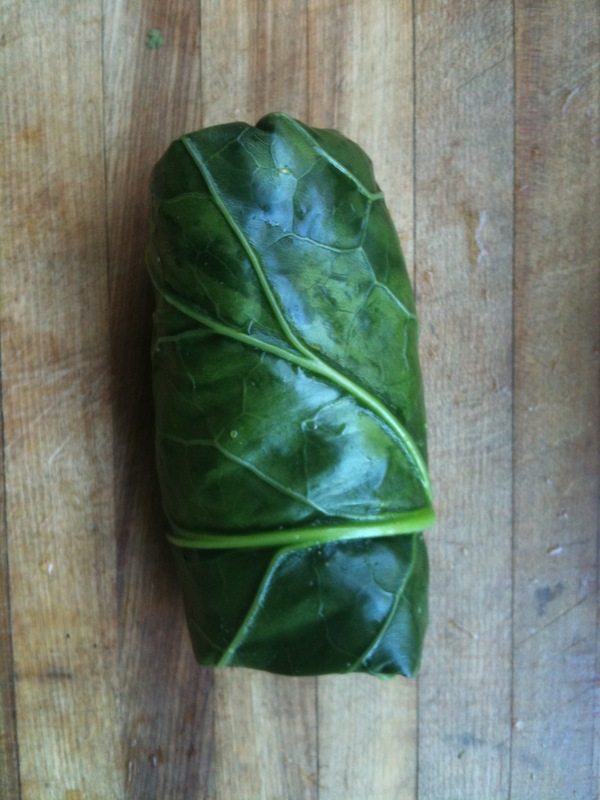 Place the collard wrap on a clean surface and scoop 1/3 of the egg filling into the center of the leaf. Fold like burrito to make a wrap. Do the same with the last 2 leaves. Put it all in a food processor and blend! Add salt and more lemon juice until reaching the desired taste. Sounds yummy! Love your pesto idea! Will definately try! These look awesome! I think I’ll have to try out your recipe for sure. You’re welcome Dolly. While I agree with the spirit of your comment I don’t happen to think that baked “paleo” items are necessarily bogus. I do incorporate some of them in my blog, like “paleo” banana bread and coconut macaroons. I am more and more beginning to differentiate between certain things as being Paleo (the brand) versus Paleo (inspired by evolution, biology, and common sense). I think for most people, living in this day and age, Paleo (evolution-inspired) is a great template for everyday eating and living. However, in light of our modern day values, culture, and social norms I believe there is a time and place for these Paleo (brand) foods. I think it’s liberating for people to have options that allow them to enjoy foods occasionally without being overly militant (one the one side) and making them sick (on the other). Perhaps those things should not be labelled as Paleo. Maybe paleo-ish, paleo-ey, paleo lite, almost paleo… you catch my drift. how many wraps can you eat? Just one? they would definitely be fine for a day. Even longer if you kept the collard and egg salad separate before eating. You can always wrap the day you are meaning to eat it 🙂 Thanks for asking! Pingback: This 14-Day Paleo Meal Plan Will Help You Lose Weight Fast!